Published: June 14, 2017 at 02:41 p.m. In the latest installment of College Football 24/7's 17 for '17 series, we look at 17 offensive players who are on their way to becoming stars in the NFL. With an emphasis on prospects who play the skill positions that are the breeding ground for star-quality players, we compiled a look at some of the most prolific talents in the college game in consultation with scouts and NFL.com analysts. As such, only one offensive lineman made the list, along with five quarterbacks, five receivers, five running backs and a tight end. On the heels of an NFL draft that included two running backs picked in the top 10 for the first time since 2005, this year's crop of offensive stars includes two more dynamic rushers at the top of the list. 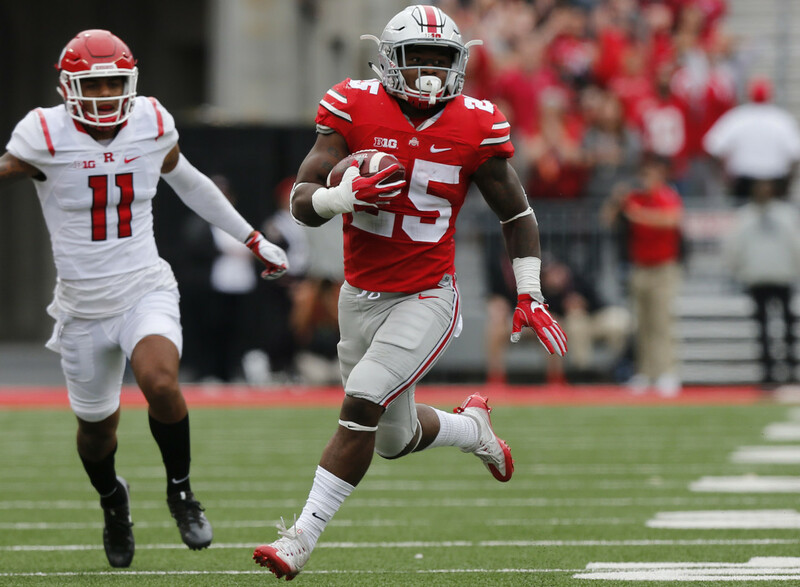 Just the third Buckeye to rush for 1,000-plus yards as a freshman, Weber was placed in a tough position last season as the replacement for Ezekiel Elliott. He responded with a robust average of 6 yards per carry and Freshman All-America honors. While he's not as complete a back as Elliott, Weber is very effective on stretch plays, shows some power at 212 pounds and figures to command more touches in the OSU offense this fall. NFL.com analyst Chad Reuter ranks him among the top 20 players in the college game. The Sooners have one of the best tight ends in the country in Andrews, who combines excellent receiving skills with enough size (6-foot-5, 250 pounds) to get the job done as a blocker. In OU's offense, of course, he spends plenty of time in the slot. He caught 31 passes for 489 yards and seven TDs last year, and with OU's top three pass-catchers last year now gone, he's the leading returning receiver on the team. As such, scouts should see plenty of production this fall. Williams' quick ascent as one of the top left tackles in college football has gone from Freshman All-America honors in 2015 to consensus first-team All-American last year. As he enters his junior year, Williams (6-foot-6, 288 pounds) already has logged 23 career starts and shows polished pass protection skills. NFL.com analyst Daniel Jeremiah has already gotten an early scouting look at Williams, and likes what he sees. The primary target of star QB Mason Rudolph, Washington is primed for a big senior season after deciding not to enter the 2017 draft. He enters the year as college football's active leader in TD catches with 26, and the chemistry he has with Rudolph makes him a legitimate threat to reach 40. Although he's built more like a running back at 6-foot, 205 pounds, Washington can pull in the jump ball downfield against bigger safeties. He caught 71 passes last year for 1,380 yards and 10 TDs. The Mustangs star was a first-team All-AAC selection last year, finishing third in the league with 104 receiving yards per game. His size (6-foot-4, 215 pounds) gives him a big advantage, and considering he once played for the SMU basketball team, you can bet he knows how use it on 50-50 balls. The fourth-year junior has averaged an impressive 16.8 yards per catch for his career. Said SMU coach Chad Morris, per The Daily Campus: "This guy has all the intangibles, all the measurables, to be a Mike Williams, a top-15 pick." Yes, Falk will come with the Air-Raid label that has been known to hound college passers making the transition to draft prospects. But Falk has a higher level of control over the Cougars offense than what is typical for college QBs taking signals from the sideline. It will take more than game management experience to break the Air-Raid stigma, but he did win over one NFL club's director of college scouting last year. NFL.com analyst Lance Zierlein is impressed with Falk's poise and accuracy, comparing him to former Seattle Seahawks QB Matt Hasselbeck. He has good size (6-foot-4, 216 pounds), experience in droves, and ridiculous production (4,468 yards, 38 TDs last year). The Crimson Tide's fourth-year junior wasn't even the leading rusher on his own team last year, but his powerful build (242 pounds) and breakaway speed make him a highly intriguing pro prospect. After seeing limited action in the early-to-mid part of the season last year, he became a bigger part of the UA offense as the season wore on, and finished the year with 812 yards on 125 carries and 11 TDs. This fall, scouts should get to see Scarbrough, who is coming off a broken leg suffered in the national title game against Clemson, on a much more consistent basis. Meet the Tigers' most explosive offensive weapon for 2017. If the introduction is necessary, it's largely because the Tigers placed four offensive skill players in the 2017 draft, so Cain probably didn't get the attention he deserved. But he's a serious vertical threat who averages a gaudy 18.1 yards per catch for his career. Last season, Cain averaged roughly a touchdown every four catches (nine TDs, 38 receptions), a remarkable ratio. There just isn't much Kirk can't do with a football in his hand. He's the Aggies' most explosive receiver, sure, but he also gives them an occasional boost as a rusher, a gadget-play passer, and on top of that, he might be the best punt returner in the college game. He's managed to post consistent offensive numbers over his first two years in college (83 catches in 2015, 80 last year) despite the fact that TAMU has juggled two quarterbacks in both of those seasons. In all, he's piled up 3,207 all-purpose yards in two years to lead a prolific Aggies offense. Ridley will be Alabama's most dangerous receiver for the third year in a row this fall, as he stepped in for Amari Cooper in 2015 as the No. 1 target in the Crimson Tide offense. Ridley's game has some similarities to that of former Indianapolis Colts star Reggie Wayne, according to NFL.com analyst Bucky Brooks. He's an explosive weapon who commands respect from defenses. The Ducks' senior will bring a compact, powerful frame to new coach Willie Taggart's first offensive backfield at UO. Capable of big plays either as a tackle-breaker inside or with his open-field skills on the perimeter, Freeman has 44 career rushing TDs, only nine short of a school record. Nagging injuries limited his production last year, but with one more chance to show NFL scouts what he can do with a healthy season, Freeman is a strong candidate to lead the Pac-12 in rushing. In 2015, he ran for 1,836 yards and broke an Oregon record with nine straight 100-yard games. After only one season as a starter for the Cowboys, Allen is already generating buzz among NFL scouts as one of the top quarterback prospects in the college game. He's a bit unpolished, but has a knack for making some amazing throws that few others can match. NFL.com analyst Daniel Jeremiah has compared his throwing arm to that of Joe Flacco. Allen threw for 3,203 yards last year with 28 touchdowns, but also threw 15 interceptions. He'll look to clean that up with another year in the Mountain West Conference. Rosen is a rare talent, as evidenced by the way he took over the Bruins' offense as a true freshman in 2015 and made easy work of opposing defenses, posting six 300-yard games that year. The Bruins star enters his third year as a starter coming off a shoulder injury that limited him to six games last year and required November surgery. He was fully healthy for spring practice. NFL.com analyst Daniel Jeremiah said last month that Rosen displays some similarities to New York Giants QB Eli Manning in his game. The reigning Heisman Trophy winner enters his junior season as the most dangerous offensive force in the college game. He accounted for 51 touchdowns last year (30 passing, 21 rushing) and made huge improvement from his freshman year. He's by no means a finished product, and NFL.com analyst Bucky Brooks recently wrote extensively about where Jackson is and where he needs to go in his development. With a powerful throwing arm and dynamic athletic skills, there will be no shortage of scouts watching Jackson this fall. Darnold doesn't have much game experience -- he didn't crack USC's starting lineup until the fourth game of last season -- but his performance over the balance of the year drew rave reviews. He led the Trojans to nine consecutive wins, completing 246 of 366 passes (67 percent) for 3,086 yards, 31 TDs and nine interceptions. Scouts were even buzzing about Darnold at the 2017 NFL Scouting Combine, even though it will be 2018, 2019, or even 2020 before he can compete there himself. NFL.com analyst Daniel Jeremiah recently had high praise for Darnold, comparing him to Andrew Luck. Guice is no secret anymore, thanks to Leonard Fournette's nagging ankle injury, which allowed Guice to make an earlier mark than expected on the LSU offense last year. He established himself as one of the nation's elite backs, rushing for 1,387 yards and 15 TDs. If you're looking for a couple of Guice believers, ask defensive coordinators Robb Smith of Minnesota and John Chavis of Texas A&M. Smith, who was Arkansas' DC last year, watched Guice run through his unit for 252 yards on only 21 carries last November. Two weeks later, Guice shredded Chavis' Aggies for 285 and four TDs. Both were crowd-silencing road games for the Tigers junior. NFL.com analyst Chad Reuter is reminded of Pro Football Hall of Famer Jerome Bettis when he watches Guice run. Barkley has an uncanny ability to make the first tackler miss, a trait that frequently affords his offensive line the luxury of a missed block, and his explosiveness makes him a threat to score from anywhere on the field. NFL.com analyst Daniel Jeremiah has compared Barkley to Pittsburgh Steelers RB Le'Veon Bell, and Ohio State coach Urban Meyer has projected him as a future first-round draft choice. Former Michigan State LB Riley Bullough regarded him more highly than Ezekiel Elliott (he faced both backs in 2015). Barkley showed up in the big games last season, averaging 6.3 yards per carry against AP-ranked opponents.